Originally designed for use by health professionals, Eurotherapy brings a new range of oscillating-pad therapy products to the UK, for use in your own home, and all our products have FREE UK delivery. Full product demonstrations are available. 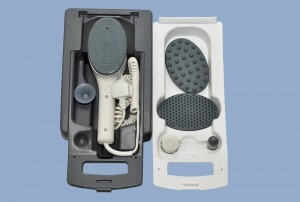 The Eurotherapy Classic is our unique hand held oscillating pad product, developed by experts in Germany. Designed for the health professional market, the Eurotherapy Classic is now available for home use. Weighing just 1.4kg (3 lbs) with a sturdy 1.3kg carry case, this lightweight, robust product offers comfortable hands-free treatment of your hands, feet, shoulder, neck, back, hip, thigh, knee, or joints, and comes with an optional heat setting which quickly reaches 40°C for gentle localised muscle and soft tissue therapy. We attend over 50 major UK events, shows and exhibitions where our team are happy to give you full demonstrations of the wellbeing benefits of our Eurotherapy products.